The evolving nature of the wealth management industry makes the future of the business exceedingly difficult to predict. Unprecedented changes in technology, regulation, and client expectations are complicating the decision-making process for wealth management executives choosing how to invest limited resources to achieve the greatest return over the next three to five years. the challenges associated with investment advisory solutions that must be effectively managed for their full potential to be realized. 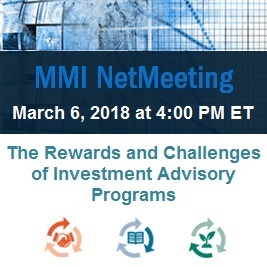 This NetMeeting replay is open to both MMI members and nonmembers, excluding press.